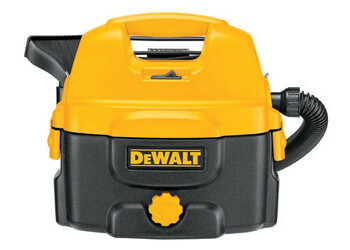 Dewalt 2 Gallon Cordless or Corded Wet/Dry Vac. Runs off of 12V-18V DEWALT battery packs or 120V AC. Gore™ wet/dry filter traps 99.7% of drywall dust. Wet/Dry filter eliminates change overs. Washable filter- tap or water rinse to clean. Heavy-duty rubber hose provides durability and flexibility. Drain port on tank for easy emptying of liquids. On-board hose, cord and accessory storage provides convenient transport and storage. 5 foot heavy-duty rubber hose.